I think I read too many books and watched way too much TV growing up. I have a very romantic view of how the world should be, how every problem has a clear cut answer that is reachable in a half hour to two hour time period (depending on sitcom or movie). Experts say that people in my generation do suffer from that. We want forensics teams like the ones on CSI to tell us every detail, even the thought process of the murderer, and give us not only the undeniable proof of who is guilty, but why they committed the crime. Personally, I also want every rift in a relationship to be settled, and by settled I mean all hurts forgotten, at the end of the day. Ah, wouldn’t it be grand! Alas, we live our lives in the real world, where there are no scripts and no safety nets. Feelings get hurt. People have agendas. Procrastination rules. Clothes need to be laundered. (Have you ever noticed that in movies and TV no one ever has to do laundry except if it takes them down to the laundry room where BAD things usually happen?) In the real world, we have the everyday task of just living life. I think that’s why I do live my life in my head at times. Not always—there’s enough reality in my life to keep me grounded–but in my head, I’m not that middle age Mom walking into the grocery store. I’m the glamorous, but cool-under-pressure undercover cop who knows the butcher has a secret I need to bust wide open. And that guy at the gym? Well, he didn’t always bench press like that—he started working out to get into shape after his girlfriend walked out on him for his ripped ex-best friend. I suggest you try it sometime, if it isn’t something second nature to you already. I’ll warn you though—it’s kind of addictive. Endless possibilities—and you get to make the ending whatever you want. I’ll bet it even wards off dementia in those later years. So the next time you’re driving down the road and at the stop sign that hawk turns to look you straight in the eye—was it really a bird? Or could it be the long departed soul of the warrior searching for his young, Indian princess bride? It’s 2014 and I’m finally blogging! After much internal dialogue (and debate), I’m putting “it” out there. You see, “it” was what all the debate was about. What do I have to add to the internet that’s not already been blogged, tweeted and posted by ten thousand other people already? Maybe nothing new, wild and crazy, but perhaps that’s not the point. So why The Lighthearted Dragonfly? I have always loved dragonflies and how beautiful and delicate they are. Especially the blue ones. They apparently like me, too–they seem to land on me often. 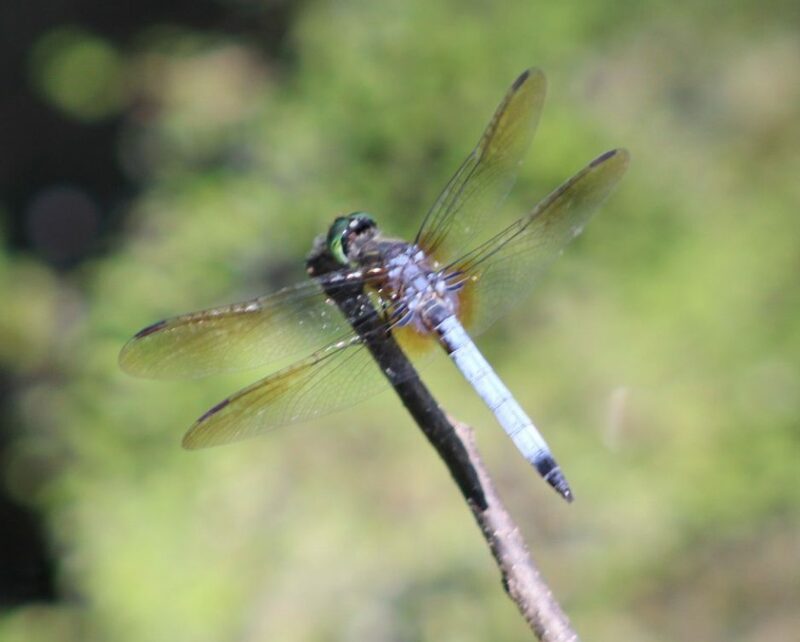 When trying to think of a blog name (not as easy as I thought it would be) I found a website that talked about dragonflies and their meaning. It said they symbolized transformation, joy and lightness of being. I latched onto that. How inspiring to envision the slender, iridescent dragonfly, full of lightness and joy, perched on my shoulder as I blogged away. At least that’s how I envisioned it. I have found dragonflies spark my creative muse. And they make me happy.